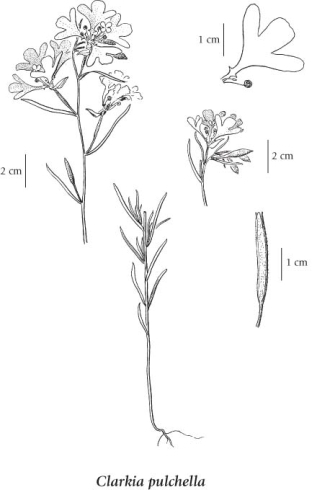 Annual herb from a short taproot; stems 10-50 cm tall, simple to freely branched, short stiff-hairy. Alternate, linear lance- to spoon-shaped, 2-7 cm long, 2-10 mm wide, entire to finely toothed. 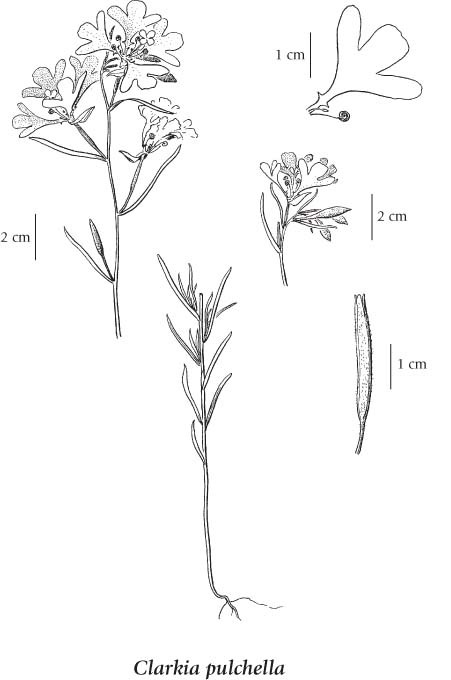 Inflorescence a few-flowered, short raceme, buds nodding; hypanthium 1-3 mm long, glabrous inside; corollas slightly irregular; petals lavender to rose-purple, 3-lobed, middle lobe the widest, narrowed to a slender claw, short tooth on each side near the base; sepals usually joined and turned to one side; fertile stamens 4, the anthers coiling after shedding pollen, the others reduced and without functional pollen; stigmas oval-oblong, 1-3 mm long, white. Capsules, straight or curved, about 2 cm long. 1. Petals not narrowing to a claw at the base; flowers regular, closing at night. 1. Petals with a distinct, narrow claw at the base; flowers slightly irregular, not closing at night. Dry, open areas in the steppe and montane zones; infrequent in S BC east of the Coast-Cascade Mountains; S to OR, ID and MT.